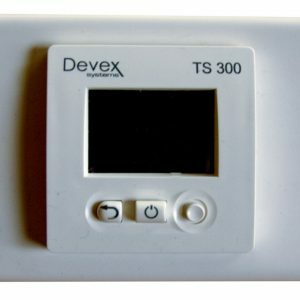 The Devireg 530 series are simple and efficient indoor room thermostats, which ensure precise control of electrical floor heating in rooms with all kinds of flooring. 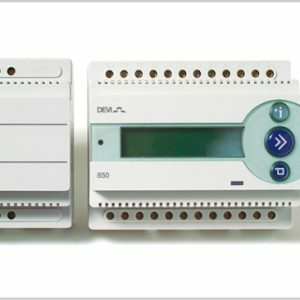 They can be used in conjunction with C-Bus or other home automation systems, and are ideal for separate 24 hour time clock control of zones with time-of-use metering. They are semi-recessed, wall mounted and they come with a backing plate that can be mounted horizontally or vertically, and is the same size as a standard switch plate. 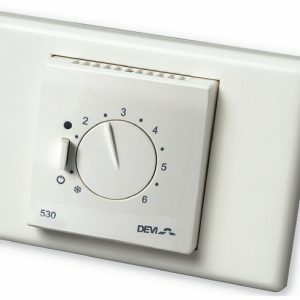 The Devireg 130 series consists of simple and efficient indoor room thermostats with a modern design. 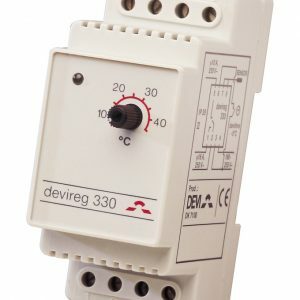 The Devireg 130 series ensures simple and precise control of electrical floor heating and ceiling heating in rooms with all kinds of flooring. 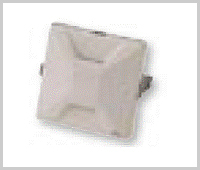 These thermostats can be used in conjunction with C-Bus or other home automation systems. 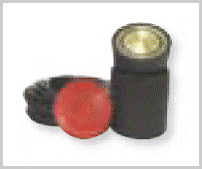 They are ideal for separate 24 hour time clock control of zones with time-of-use metering. The Devireg 850 is the ideal solution for keeping an area free of ice and snow. Devireg 850 acts on information received from the sensors, which detect both temperature and moisture. Devireg 850 calculates the information and switches on only when the chosen combination of low temperature and moisture level are detected. 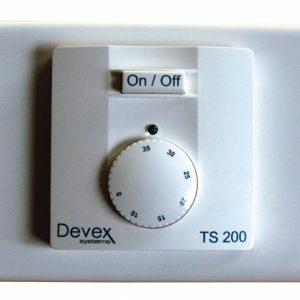 This saves energy and reduces running costs. Devireg 330 is a 2-module DIN rail mounted unit and comes in five versions, each with a different temperature range to suit your application. 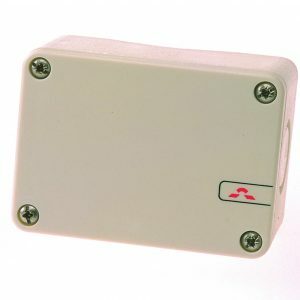 Can be used in conjunction with C-Bus or other home automation systems. Ideal for separate 24 hour time clock control of zones with time-of-use metering. 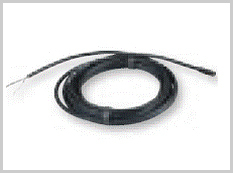 The sensor probe can be extended to a central control position or the main switchboard for direct or contactor control of heat elements throughout the installation.